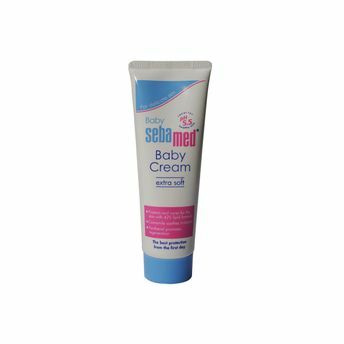 Sebamed Baby Cream is extra soft baby cream is gentle on baby skin and is considered to be one of the best baby skin care products around. This extra moisturising baby cream smoothens the baby's skin and helps to soothe the irritated skin. The pH value of 5.5 of Sebamed Baby is clinically proven to promote the development of skin's acid mantle which protects the skin from entry of harmful bacteria and prevents moisture loss. This cream is also ideal for babies prone to very dry or flaky skin. The water in oil emulsion with 42% lipids from a Moisturizing film without interfering with the skin's breathing process. Explore the entire range of Lotions & Creams available on Nykaa. Shop more Sebamed products here.You can browse through the complete world of Sebamed Lotions & Creams .Alternatively, you can also find many more products from the Sebamed Baby Cream Extra Soft PH5.5 range.